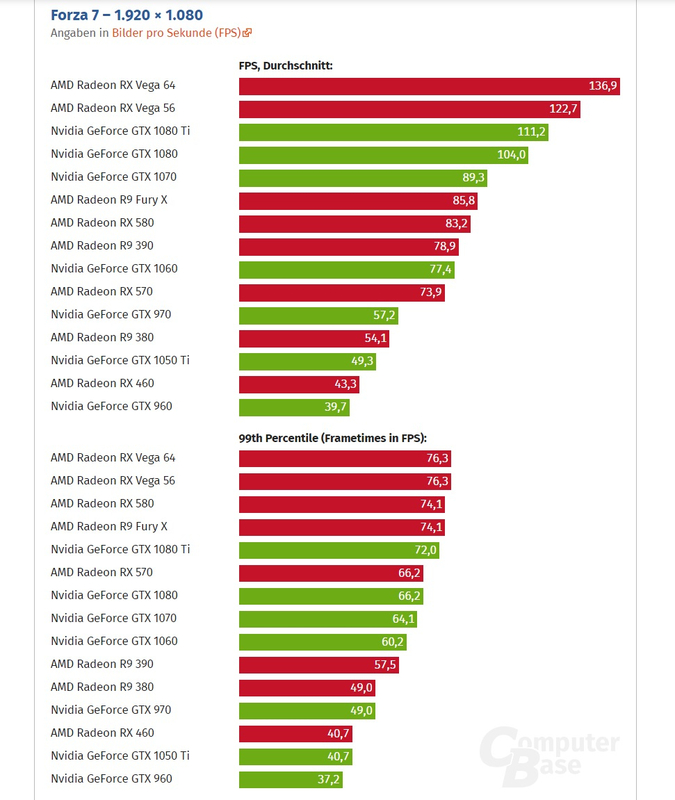 The RX Vega 64 / 56 cards dominate the 99th percentile frametime tests for all resolutions in Forza 7, while the GTX 1080 Ti only manages to stay on top in the 4K FPS test. The new RX Vega 64 / 56 GPUs from AMD proved themselves as good alternatives for Nvidia’s GTX 1080 / 1070. 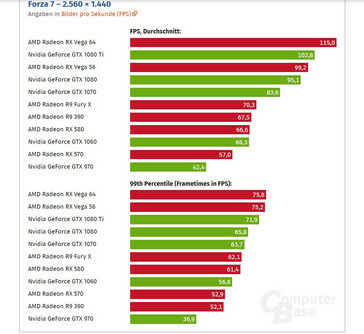 The AMD cards seem to have a small edge in newer DX12 games, but are slower in non-DX12 ones. AMD's RX Vega 64 can’t really compete with the GTX 1080 Ti, however, as tests indicate the AMD card is ~20% slower overall. 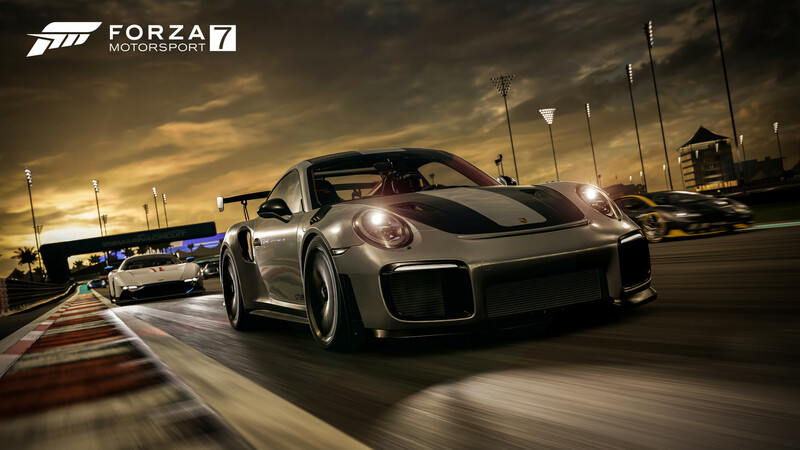 Surprisingly enough, the new Forza 7 seems to favor AMD’s cards in DX12, with the GTX 1080 Ti lagging behind both RX Vega 64 / 56. ComputerBase.de tested a variety of new and old cards in Forza 7 DX12, and it turns out AMD’s RX Vega 64 / 56 outperform even the GTX 1080 Ti. The differences are more obvious in the 1080p tests, where the RX Vega 64 scored 23% higher than the GTX 1080 Ti, while the RX Vega 56 managed to get ahead of Nvidia’s top GPU by 18%. The 99th percentile frametime test also puts the two RX Vega cards ahead of the GTX 1080 Ti. Results get tighter in the 1440p test, where the GTX 1080 Ti takes the second place, while the RX Vega 64 is ahead by 18%, and the 99th percentile test I still dominated by the RX Vega GPUs. The GTX 1080 Ti manages to squeeze the most FPS in 4K, but remains behind the two Vega cards when it comes to the 99th percentile test. 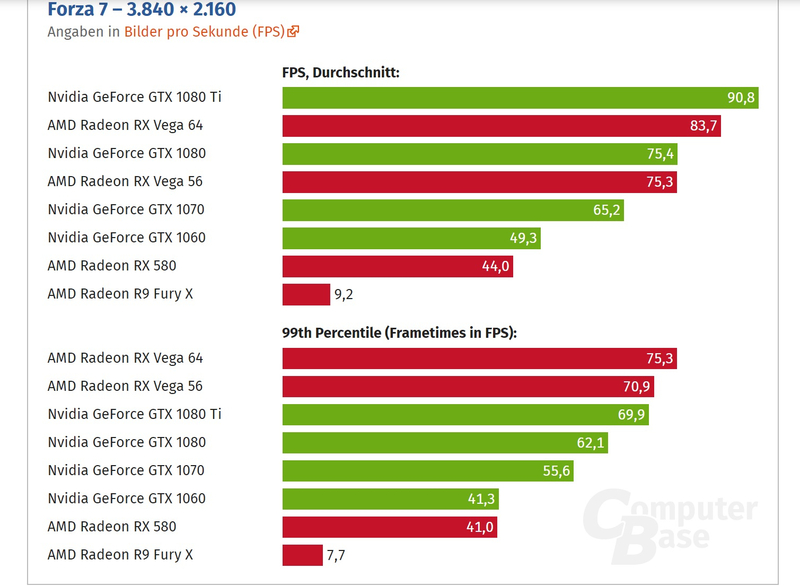 Another surprise comes from AMD’s R9 Fury X performance in the 4K tests, as it only managed to score ~7 FPS. AMD should fix this issue in an upcoming driver. All tests were conducted on a system sporting Intel’s Core i7-6850K overclocked to 4.3GHz, coupled with 16GB of DDR4 memory running at 3000MHz in quad-channel mode. The AMD cards ran on the Crimson ReLive 17.9.3 drivers, and the Nvidia cards used the GeForce 385.69 drivers. 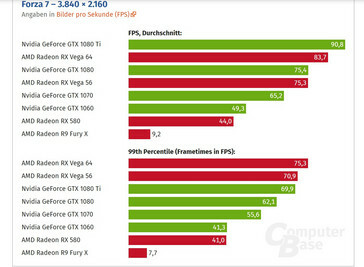 Nvidia has already confirmed the results and will probably try to increase the performance in the next driver release.